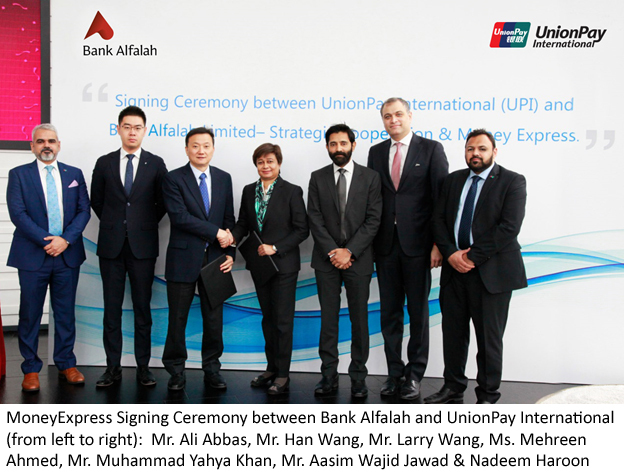 [Karachi, April 10, 2019]: UnionPay International (UPI) and Bank Alfalah have signed an agreement to launch MoneyExpress in Pakistan. MoneyExpress, powered by UnionPay, is an easy way to send money electronically to anyone in Pakistan with a UnionPay card. MoneyExpress eliminates the hindrance of wire transfers and cash, so that sending money is simple, secure and fast. Additionally, through MoneyExpress, Bank Alfalah and UnionPay cardholders abroad will be able to send money back to Pakistan to any card, bank account or mobile wallet. This will enable overseas Pakistanis to seamlessly remit money while making it convenient for their beneficiaries to receive it sitting at home. Mehreen Ahmed (Group Head Retail Banking, Bank Alfalah) and Larry Wang (Vice President Business Development, UnionPay International) signed the agreement between the two entities in Shanghai.